BP hopes to contain the spill from its leaking well in the Gulf of Mexico within 24 hours, its chief operating officer, Doug Suttles, has said. 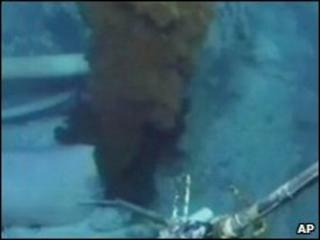 An operation using undersea robots to cut off the fractured pipe and seal it with a cap was launched on Tuesday. It comes as US Attorney General Eric Holder announced that officials had begun criminal and civil investigations into America's worst oil spill. Mr Holder would not say which companies or individuals were being targeted. Reuters news agency quotes BP as saying it would "co-operate with any inquiry that the Department of Justice undertakes". BP's shares fell sharply on Tuesday after the failure of its previous efforts to "top kill" the leak by pumping mud into the well. At one stage the share price hit its lowest level for 15 months, as stock markets digested the news that the US was "prepared for the worst scenario" that the leak might not be stopped before August. In the latest attempt to fit a containment cap, remote-controlled robots on the seabed are cutting the damaged well riser in order to cap it and pipe the leaking oil to the surface. Image caption BP has spent almost $1bn trying to contain the disaster. Mr Suttles said: "If everything goes well, within the next 24 hours we could have this contained." But, striking a note of caution, he stressed that success was not guaranteed and urged people to "remember this is being done in 5,000 feet of water, and very small issues take a long time to fix". BP says the procedure will take all week and it does not expect that cutting the riser will allow significantly more oil to escape. But government scientists suggest the procedure could release up to 20% more oil initially and the White House says it does not believe BP has been forthcoming about the risks, the BBC's Richard Lister reports from Washington. On Tuesday, President Barack Obama described the leak as "the greatest environmental disaster of its kind in our history" and pledged to bring those responsible to justice. Announcing the criminal probe, Attorney General Eric Holder said: "We will closely examine the actions of those involved in the spill. If we find evidence of illegal behavior, we will be extremely forceful in our response." Mr Holder, who was on his first visit to the affected region, said the companies involved had already been ordered to preserve their records. Meanwhile, the National Oceanic and Atmospheric Administration (NOAA) warned that winds forecast later this week could move the spill towards the Mississippi and Alabama coasts, which have been less badly affected than Louisiana's shores. Tuesday also marked the start of the hurricane season, with NOAA predicting up to 14 hurricanes, of which between three to seven will be "major" tempests, packing winds in excess of 110 mph. At least 20 million gallons (76 million litres) have now spilled into the Gulf, affecting more than 70 miles (110km) of Louisiana's coastline. Eleven rig workers died when the Deepwater Horizon rig exploded and sank six weeks ago. Responding to calls for the US military to take the lead instead of BP, Adm Mike Mullen, chairman of the Joint Chiefs of Staff, told US media on Monday that the military was not as well equipped as the oil industry to deal with the spill. The Obama administration has come under increasing pressure to find a way to mitigate the environmental and economic impact on the Gulf area. On what would normally be a busy holiday weekend, fishing boats sat idle in marinas along the Louisiana coast, as many fishing areas remain closed as a health precaution.